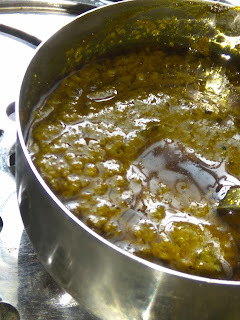 Add coconut, roasted fenugreek powder, garlic, fried gram, coriander powder, Cumin powder, poppy seeds, tamarind and water. Grind to a nice paste. Heat oil in a pressure pan over medium heat. Reduce the flame to the low level. Add turmeric and chilly powder. Saute until the shallots and tomato well cooked. Add coconut paste and stir well. Now the masala we added sauteed. Add another quantity of water 200 ml. Close the lid and place the whistle. Allow to pressure cook until three whistles. Set aside to cool and release its pressure of its own. Open the lid and stir the fine gravy with soft beans. Turn on the heat to low medium. Good stirs to be given. Now, pour the sesame oil and stir again. Check the salt. add salt if needed. 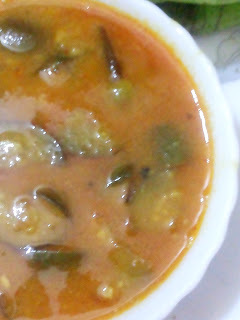 A very fine aromatic Field Beans tamarind curry/Pachai mochai kuzhambu is ready to enjoy. This is a versatile dish to be enjoyed with hot-steamed rice/Ven Pongal of Pongal festival(Raw rice Pongal) and goes very well with south Indian main dishes such as Idlies, Dosas and so on. 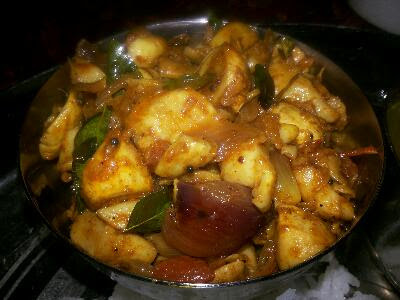 This is Pongal special recipe of Kongu Regional food. Pachai mochai/Field beans are the best sources of protein, fibre, Vitamin A and C, potassium, and iron, Calcium, Magnesium and manganese and what not. These legumes are well packed with all the nutrients that we needed for the healthy body. This variety of beans are known as Butter Beans because of its mild buttery flavour and meaty texture.